Covert warfare fought with secret advanced technology may be occurring in the skies over North Korea. All North Korean missiles have been mysteriously blowing up after launch. Starting on March 23th through April 29th 2017, four North Korean missiles have blown up. The latest “missile failure” by North Korea chalks up four missiles of differing varieties that have been lost in the boost phase of launch in the last five weeks. North Korea has been launching missiles for years. Sometimes several at a time. Having better than a two thirds success rate. Very interesting that just last month on March 6th 2017 North Korea successfully launched five missiles at the same time. Kim can’t seem to get any missiles off the ground now. What happened? All of these missiles were lost in the boost phase of flight. No other anti-missile system was ever tracked on radar physically intercepting the North Korean missiles. Leading to the possibility that an advanced directed energy weapon is being used to take down the North Korean missile tests. These systems have been in the U.S. arsenal for years and can be mounted on ships or aircraft. A complete breakdown of the Air Borne Laser Systems most likely being used over North Korea was written on April 17 2017 predicting that North Korea would be having many more mysterious “missile failures” in it’s future. March 6 2017: This is the incident that probably pushed the United States and it’s allies in the region to make the decision to employ some sort of covert anti-missile defense. North Korea launched five missiles at the same time from Tongchang-ri region north of Pyongyang. All of them successful with four landing in the sea of Japan. Ruffling more than a few feathers with the nations in the region. This show of force may have been the final straw and the reason to deploy a covert anti-missile defense. North Korea can’t seem to get a single missile of the ground since then. Having to resort to massive firings of antique artillery pieces to scare the world now. March 22 2017: This launch occurred around Kalma International Airport near the eastern coast of North Korea. The missile exploded “within seconds of launch,” according to US Pacific Command. This was first in the latest string of North Korean missile tests blowing up in the boost phase. Taking down the missile in the boost portion of it’s launch would allow any payload to remain the problem of North Korea. No other projectiles were detected on radar intercepting the test, such as a THAAD anti-missile system launch, before the missile blew up. Indicating some sort of air or sea based directed energy weapon may have been employed. April 5 2017: North Korea conducting this missile test from Sinpo in the South Hamgyong province also along it’s eastern coast. The missile mysteriously blowing up right after launch with nothing seen on radar intercepting it. This began speculation in the media that the missile tests were somehow being hacked. In a country that hardly has electric most of the time let alone internet. It would be hard to attribute all of these failures to some sort of malware put on North Korea’s missile systems. North Korea has launched different varieties of missiles over the last 5 weeks. All have been lost in the boost phase. Many of the missiles lost are 1960s designs that still use manual systems not advanced computers hooked to the internet. Getting an agent inside North Korea’s missile program to physically implant the malware is an even more dubious assumption. The regime routinely kills anyone suspected of even having a cell phone. Getting an agent of the United States close enough to the missile command and control systems of the “Hermit Kingdom” would be next to impossible. April 16 2017: Another North Korean missile lost in the boost phase of it’s launch window fired from Sinpo on the northern coast of North Korea. Tracked by Pacific command the missile once again broke up for “reasons unknown”. American officials have been very quiet on the whole matter. This is the very nature of advanced weapons systems such as a ship mounted laser or an Airborne Laser System deployed on manned and unmanned aerial vehicles. Giving a large amount of plausible deniability to the United States. North Korea has no way of proving a laser shot down it’s missiles. Although they are most probably suspecting that something like this is going on. The next launch was moved much farther inland to test the range of these systems and increase the chance of a successful missile launch. April 28 2017: In the latest prevocational on the Korean Peninsula a missile test was conducted by the North Korean regime further inland. Against the wishes of both China and the United States the missile was launched was on 4-28-17. It broke up shortly after take off. More than likely it was shot down by an Airborne Laser System. The KN-17 truck launched missile broke up 44 miles above it’s point of origin in the boost phase of it’s flight pattern. Very revealing that this is a truck launched missile that failed. Almost assuredly not hooked to any type of internet. What little internet there is in North Korea. So the “hacking is bringing North Korean missiles down story” given by the main stream media falls apart. This is the fourth missile to go down of differing varieties in the boost phase over the last month. North Korea is most certainly aware that these systems are being deployed. 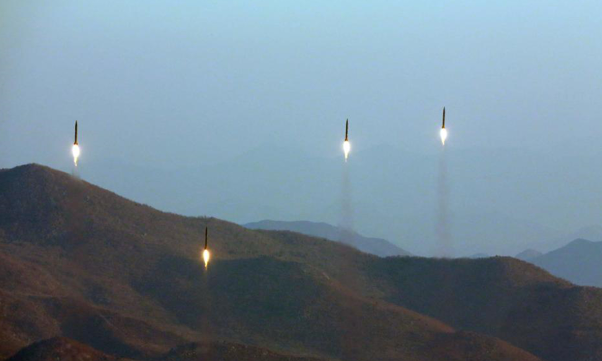 The latest missile launch came from Pukchang region north of Pyongyang. North Korean military is gauging the effective distance of the Airborne Laser System. Sending up only a modified SCUD missiles as bait for the American system. Most of the Airborne Laser Systems, either drone or manned, prefer to loiter outside of enemy territory. Minimizing risk to these very expensive airframes. Positioning a missile launch inland would allow more air space away from international waters. Where an Airborne Laser System is most likely placed. Allowing North Korea to accurately assess the effectiveness of an Airborne Laser System. The test came as U.S. Secretary of State Rex Tillerson warned the U.N. Security Council that failure to curb North Korea’s nuclear and ballistic missile programmes could lead to “catastrophic consequences”. All of these “missile failures” fit the exact intercept pattern of an Airborne Laser System attack. Waiting until the ballistic missile was well above most atmospheric distortion at about 40 miles in altitude. Aircraft flying at 60,000 feet would aim up at the missile from a distance. The ballistic missile is easily engaged as the hot exhaust plume is more visible to infrared sensors. There is less air distortion to disturb the main laser. Allowing the main laser to focus maximum energy to the body of the missile. Super heating it until it explodes. The decision to deploy advanced directed energy weapons may have been made. The results are being witnessed by the entire world though most do not know what they may be seeing. This is the very nature of advanced weapons systems. Giving a large amount of plausible deniability to the United States and it’s allies in the region. Warning the North Korean regime and offering a quiet way out. Demonstrating that an escalated war can not be won by North Korea. Expect more North Korean “missile failures” and the corresponding misdirection in the western main stream media. I do believe your assertion has merit. As you have quite succinctly illustrated there is no other possible way that the US could have infiltrated NK brutal fascist regime in any of the old clandestine spy game ways – what better way to humiliate him in front of his own people which undoubtedly helps plant seeds of doubt among his generals. I believe certain superpowers of the world are now currently ready willing to begin using the future tech we’ve all been warned about for years now and are seeing the dawn of a new age of warfare. Some are even calling it the beginning of a very ominous and daunting chapter in human history as we approach what certainly looks like a manufactured ‘end of days’. Personally I wonder if this isn’t the beginning of an aspect of Project Bluebeam?